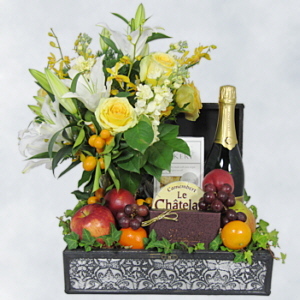 When you want to make an impression, it is hard to beat this combination: A silver chest filled with sparkling wine, a vase of elegant flowers, Fresh Cheese, Rustic Bakery Flatbread, Fruit, and Decadent Chocolate. Whether you choose the Carra Prosecco, upgrade to another champagne, switch to red or white wine, or instead substitute our wonderful Elderflower Presse in lieu of wine, this will be a gift that dazzles. Please call with any customization questions as the possiblitlies are almost limitless. Note: Sorry, we cannot ship the fresh flowers outside of Los Angeles. We can substitute a flowering plant in place of the flowers, please select 2 Day Air Shipping if it is going East of the Rockies. Feel free to call and talk to us about any shipping questions or changes.